Photographically speaking I do not feel this year has been that productive. I have been thinking a lot about the future direction of my photography but not been making many new images. In the past I would have regularly slung a camera over my shoulder or taken one out in a small bag in the hope that something might grab my attention. In recent months I haven’t bothered to do so and I know I have missed some opportunities. However if the creative juices aren’t flowing then I don’t believe that you can force the issue. If you are not in the right frame of mind then perhaps a break is required in the hope that given time the desire to make new images returns. The picture in this post gives me some encouragement. It was captured last week as my wife and I took our dog for an early morning walk at Ringstead Bay in Dorset. I had a camera with me, a Sony RX100. A compact camera which I very much enjoy using when I remember to pick it up before I go out! 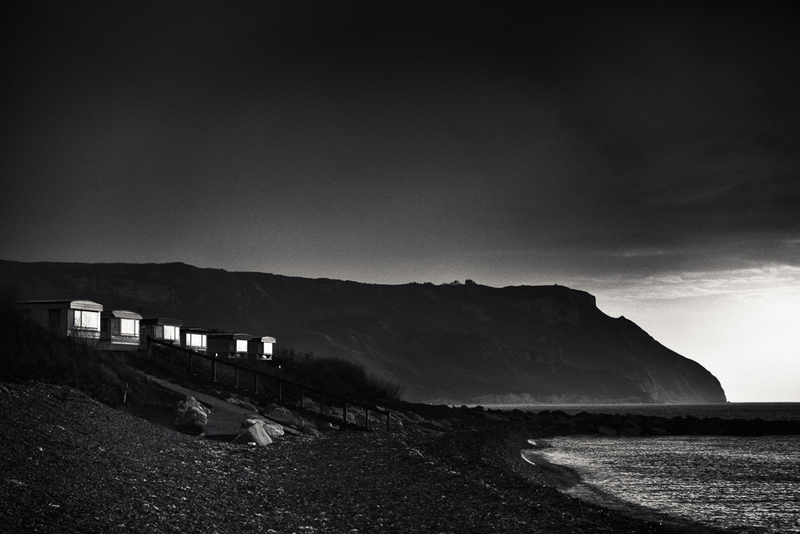 I didn’t see much to photograph apart from the morning light shining on the mobile homes which overlook the bay. The sky was dark but on the horizon lay the prospect of a brighter day. When I took the shot I immediatley knew how the final image might look. I have not experienced that feeling for quite a while. ‘It’s not all Black & White’ this Christmas. Surely this one will spur you to get back to your Photography. Very atmospheric and I love the bright window lights shining out across the rocky shore. As an aside, it was only when I wanted to do a post on this year’s favourite photos, I realised I’d hardly done any photography at all myself, just re-posts of images from my archives. So hopefully 2019 will be more productive. I love your B & W photography – its very inspiring and stirs those long forgotten creative juices of mine. Thank you Vicki. At times I think I am little too harsh on myself as I have made some pleasing images this year but what may be lacking is a clear sense of direction. Perhaps 2019 will bring about that change. Good luck with your own photography. I believe everyone goes through quieter periods if only to recharge their creative batteries.